Miniature rifle shooting became popular in the early 1900s. 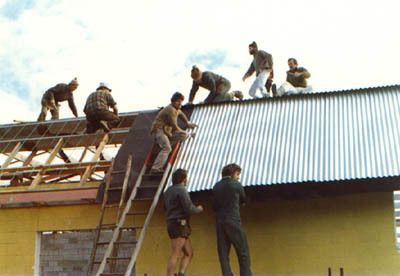 Over the years volunteer rifle units had functioned mainly under their own leadership, being coordinated by the NZ Government. On deciding to form a defense corp, various forms of shooting were introduced with cadet and territorial units. One of the most popular types resulted when a lightweight rifle consisting of a Morris 22 calibre tube was fitted to a standard Lee Enfield stock. This rifle, being light and easily handled, was popular with the younger cadets in early competitions when the sport gradually became known as miniature rifle shooting. One of the earliest clubs in the Manawatu was the Linton Club (1914) shooting on an open range at Hokowhitu. 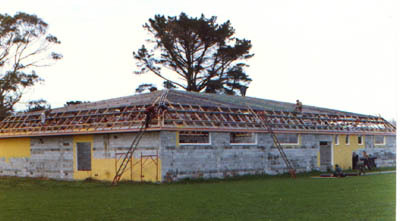 This club amalgamated with the Linton Defense Rifle Club in 1915 and, when this range was closed to club shooting in late 1915, the first indoor 25 yard range was constructed in King Street, Palmerston North. Shooting stagnated until 1920 when a surge of popularity saw the following clubs formed in quick succession, PNRSA (1920), Rongotea and Bunnythorpe (1921), Awahuri (1922) and Oroua Downs (1923). Most of these clubs had links with large bore shooting in the past. The first competition held between these clubs was for the McKelvie Cup which had been donated to the Rongotea Club by Mr J McKelvie, a prominent farmer who owned the large Pukemarama Station at Carnarvon. This was a fine silver trophy valued at Å“20 ($40) and was shot under challenge conditions by a ten man team. In 1923 the conditions of this trophy competition were altered so that any club within a 25 mile (40 km) radius of Rongotea could take part. The Bulls Club quickly took advantage of the change by winning the cup in mid year, Marton won it next, followed by Linton. Ideas and suggestions for a more formal style of competition had been mooted for some time as neighboring associations had been formed at Wellington and Wanganui. As a result of these discussions, the Linton Club instigated a meeting to be held at Rongotea on the 1st of May, 1924. At this meeting, representatives of the following clubs attended, being Mr F Wright and E Arnott, (Rongotea): D Beattie and C Cleaver (Awahuri): R Jones and E Berry (PNRSA): and C Page (Linton). An apology was received from Oroua Downs and Mr E Arnott was voted to the chair. After formal discussion, Mr Page moved: that in the interests of miniature rifle shooting, an association be formed to be known as the ‘Manawatu Miniature Rifle Association’. The motion was carried unanimously and it was further agreed that the headquarters should be in Palmerston North. Mr Jones was elected as Secretary and Mr C Page as President for the year. It was also agreed that the delegates present form the nucleus of the Association committee, and that subscriptions be Å“1/1/- ($2.10). Arrangements were made for the various clubs to purchase ammunition and targets through the Association, thus obtaining them at the lowest possible rates. The Secretary was instructed to write to the Bulls and Marton clubs to ascertain whether it was their intention to compete in the competitions organized by the Association. Bulls agreed whilst the Marton Club declined. Matches organized for the first year of competition were the Cliffe and Remington Cup to be fired under the postal system, and the McKelvie Cup matches whose conditions had been changed from a challenge cup to a series of round robin matches shot under travelling conditions. Both were to be contested by teams of 10 men over 2 rounds. Several postal matches were later arranged with the Wellington Association where a team, consisting of the holders of the 20 highest aggregates in the Association were selected, resulting in a win and a loss to each team. © Manawatu Smallbore Rifle Association All Rights Reserved. Theme zAlive by zenoven.